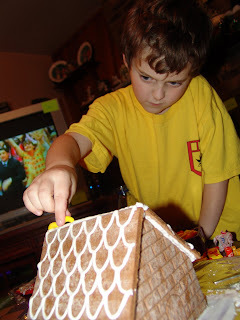 Ryan and I made our ginger bread house on Sunday. It turned out really cute. Ryan loved it ! 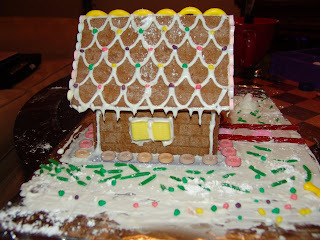 Ryan designed the roof and put the little banana runts on the top. We used Starburst as windows. He had so much fun. It looks great!! I can't wait to do ours this year! I have never made one of those.....do you actually eat it??? That is so cute! 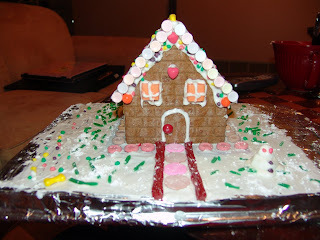 I tryed making one a couple years ago and it didn't turn out looking like a house...it didn't look like much of anything! Yummy.Ours never stay together so I give up on those.